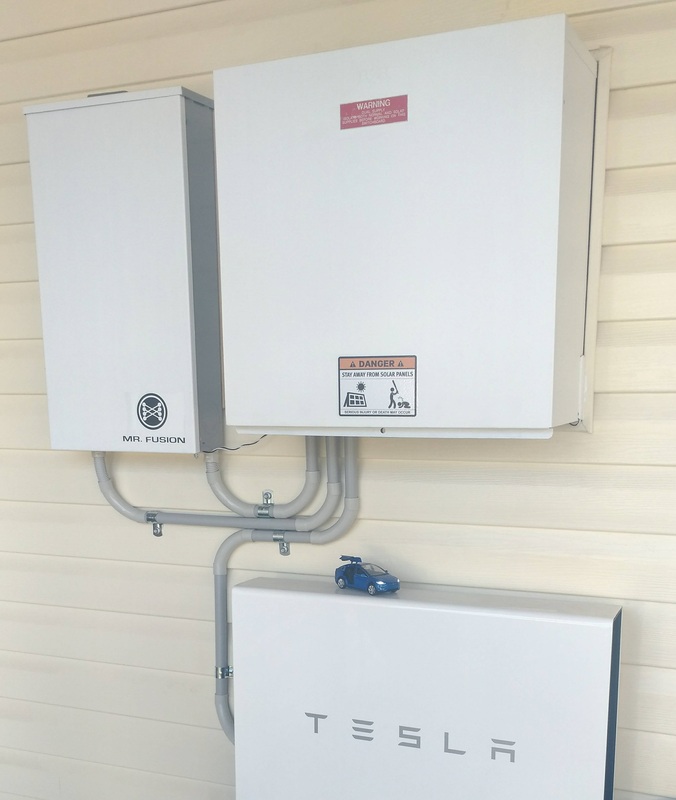 Back in June I had a Tesla Powerwall2 installed, one of the first in Australia. It’s been three months, and going well, so herewith an update. I’ve given the battleship-grey Gateway and old brown powerbox a coat of white housepaint with a roller and they came up very nice. The installers never came back with the promised warning stickers though, so I’ve improvised some…. Still no automated way to charge off-peak. You can charge the PW2 anytime you like, though – just flip the mode switch in the App under “Customize” from “Self-powered” to “Backup”, and it’ll pull down 1.7KW till full, then go into standby. Useful if you are in the middle of winter and know it’ll rain the next day, so you can grab a charge off-peak. 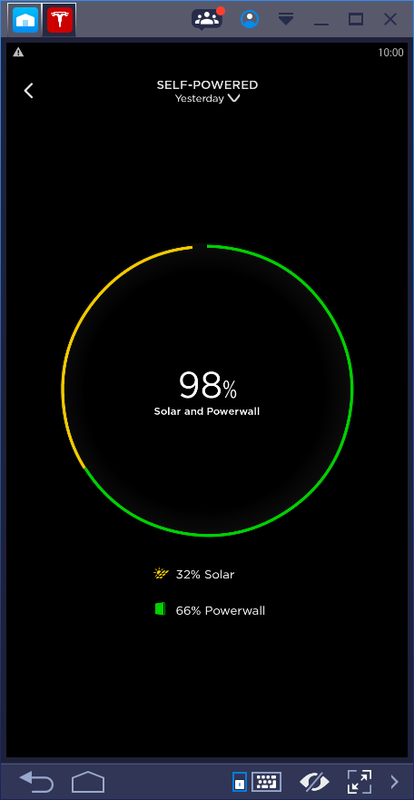 The app has been very accurate – only 0.1kw difference between the App’s reported grid numbers and my electricity provider’s numbers. If you want to track usage on a PC, the Bluestacks android emulator has been updated, now that the emulator only takes up as much space as the app screen itself, so you can have a small window open on your monitor with just the Tesla app running. It can be power hungry though, as it updates frequently, so not recommended for lightweight notebooks. The PW2 is happy to supply 5kw loads for ages, as I charged a car whilst a bunch of kitchen appliances were running to test this. The inverters will keep running if the grid is disconnected. Installs are slowly proceeding – you might get one in early 2018 if you reserve now – the initial holdup was the availability of Telstra-enabled Gateways, and now it’s shortages of batteries. Three-phase homes are still limited to PW2 installs on one phase as the three-phase Gateways are not yet available. I’ve managed to avoid Peak-Time-of-Use power usage completely – here’s August’s power bill. Only a little Shoulder usage, as this bill predates the installation of additional solar panels to keep the battery fully charged. Over 300KWhr of the 500KWhr Off-peak usage is charging a car, which is done overnight on a timer on weekdays. I often have some left in the PW2 the next morning, even at the end of Winter. 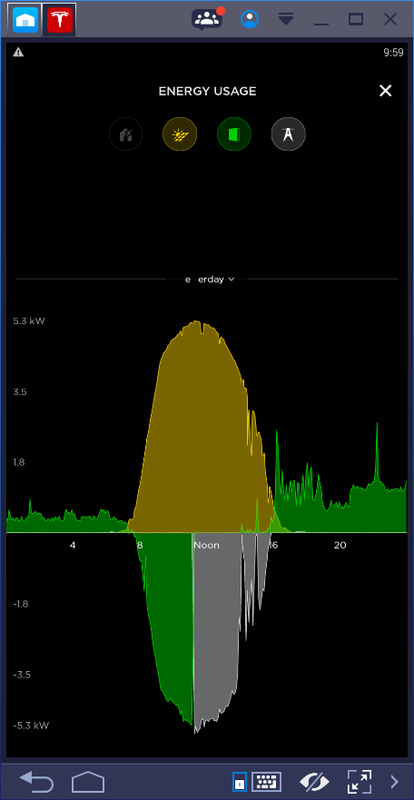 The PW2 charges by midday, and the rest of the day’s solar generation is exported, offsetting the grid-connect charge. On a sunny day. the solar panels and PW2 combine to completely eliminate grid power draws. 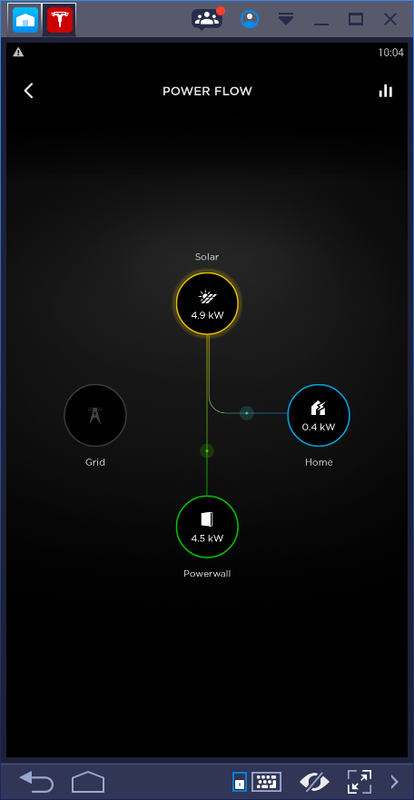 The PW2’s max charge rate is 5kw – it’ll start exporting to the grid once the solar generation goes above 5kw. For the last month at the end of Winter period, I charged in 322Kw, and withdrew 271kw – a round-trip efficiency of 85% or 92% for each leg. Since there was a lot of rapidly-varying loads from bar heaters, and solar was a bit spotty, these may have had something to do with the efficiency, as it seemed to do better on days when the loads and solar were constant. Here’s a shot of the last 4 weeks usage. Note that this was taken just after the PW2 reached a full charge, so the efficiency number should really be be closer to 88% round-trip / 94% each leg (322Kw in, 285Kw out), if I were taking that charged-in amount into account. As I’m often charging a car with 10-12KWhr a day, I found that 4.7KW of old panels wasn’t really enough to fill all the batteries, and I ended up putting another 2.2KW of panels on the last space on the roof with a separate Fronius inverter wired into the old Aurora inverter’s power-board feed-in wire. These eight panels generate 11Kwhr a day on their own, and should be paid off in under 4 years, even if the majority of the power gets exported in the Summer months. 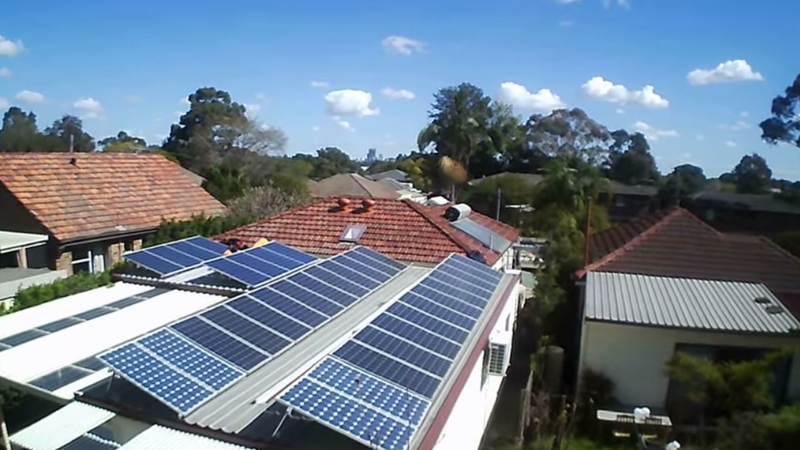 Endeavour didn’t seem to mind me having 9Kw of inverters and the 13.5Kw PW2 in my single-phase home, as they approved the second inverter without requiring any export limits. The max the system could produce would be close to 6Kw, and that could be exported if the PW2 was already charged in the morning. The photo’s a screen-cap from the drone-cam Youtube video, hence the blurriness. Has the financial argument changed? I originally assumed that round-trip losses would be small enough to ignore, but 88% efficiency factor is worth taking into account, so I have updated the spreadsheet that calculates payback time. You can download it and put in your own variables to see if PW2 can work out economically for you. In the past months, I have moved from a fixed tariff to Time-of-Use, and of course, the power prices have all gone up nearly 16% here since then, so even with the reduction of solar FiT that the round-trip losses cause, I’m still likely to pay off the PW2’s capital cost in under 9 years. Would I buy it again, now that I know more than what was available on launch day? Yes – the government doesn’t seem to be doing anything to control the runaway inflation of power prices here, given the focus they have on support for ageing coal-power station profits, so becoming less reliant on the grid is worthwhile for me. This entry was posted on September 7, 2017, 12:25 pm and is filed under Power. You can follow any responses to this entry through RSS 2.0. You can leave a response, or trackback from your own site. I have just read your original article and this one as my PW2 will be installed next Monday. Currently I have 8Kw of panels which produced 35 Kwh of power yesterday. Note, I am on the east coast of Tasmania. I am already on TOU tariff, which did not increase in July this year but my Fit went from 6.7c to 8.9c – nice. I am thinking I Will increase panels to 10Kw. 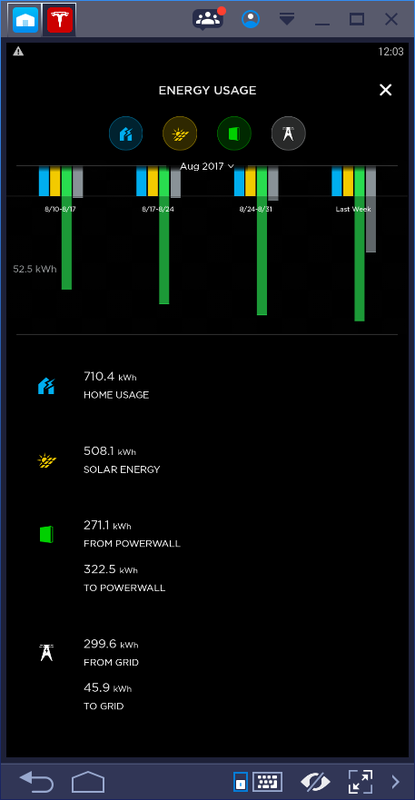 Also my house is heated with floor heating – 14 Kw (not all on at once normally) so I expect/hope to have a net power bill of $0 per annum and stay connected to the grid. With that many panels you should manage to keep it fully charged. How did you load the Tesla app in Bluestacks? I tried both Bluestacks 2 and 3. V2 showed the app in the play store but it wasn’t compatible and V3 didn’t even show the app. Any ideas? I didn’t know about apkmirror. All working now. Thanks for the tip.